On August 15, 1883, Professor William Waterman Sherman leaves San Francisco in a large hot air balloon. His hope is to spend the year sailing tranquilly over the Pacific Ocean. Three weeks after departure, Sherman is found adrift in the Atlantic Ocean amidst the wreckage of 20 deflated balloons and its platform. What happened in those three weeks, and how did he end up in a completely different ocean? The adventure begins when a seagull attack on Sherman’s balloon sends him crashing onto an island that is inhabited by 20 families. This proves to be fortunate as the island’s residents are friendly; there is plenty of good food, and the best thing of all, a mine that is filled with diamonds! And even though the island is frequently rocked by ever-strengthening earthquakes, Sherman thinks he has it made. Yes sir, the volcanic island of Krakatoa is truly a paradise…that is, until that fateful day of August 27. Then things change in a hurry. 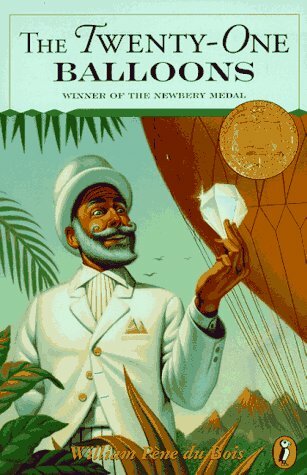 To find out what happens to Professor Sherman, the families and Krakatoa, read the Newbery Award winning The 21 Balloons by William Pène du Bois.